In 1996, Purdue women’s basketball head coach Lin Dunn was fired over alleged recruiting violations. Also out the door was one of her assistant coaches, a former Purdue star named MaChelle Joseph. To fill Dunn’s spot, the Boilermakers hired an assistant from the United States women’s national team: Nell Fortner. 23 years later, Tech women’s basketball coach MaChelle Joseph was fired over allegations of player abuse. 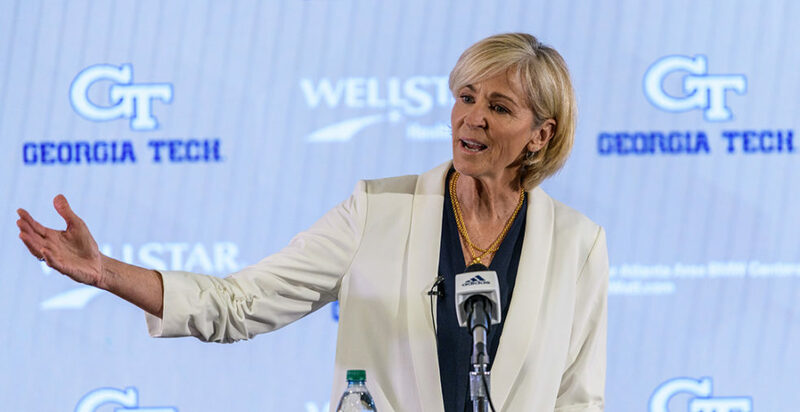 In her place arrives a former coach of a WNBA franchise, multiple college programs and a one-time USA Basketball Coach of the Year: Nell Fortner. Whereas Josh Pastner was an injection of youth into the men’s program a few years ago, Fortner arrives as a steady hand. Serving as an analyst for ESPN since she left Auburn’s program in 2012, what Fortner lacks in recent experience she compensates for in a lengthy resume. After finishing her playing career at the University of Texas and spending a few years as the women’s basketball coach at Killeen High School, Fortner began a series of assistant coaching stints, first at Stephen A. Austin, then at Louisiana Tech and finally with the women’s national team. After Dunn and Joseph left Purdue, Fortner stepped in for a year and immediately took the team to the NCAA Tournament, where they would lose to eventual tournament runner-up Old Dominion in the first round. When USA Basketball came calling again, Fortner left Purdue and became the national team’s head coach. There, she would lead the team to an Olympic gold a few years later, in 2000. When WNBA franchise Indiana Fever was formed in 1999, it hired Fortner as its first coach. Fortner would not begin coaching the team until its second season, as she was busy with national team responsibilities, but in her three-year tenure with the Fever, she led the team to its first playoff berth and first playoff win in franchise history. From there, Fortner went to Auburn, where she coached from 2004 to 2012, notching a pair of NCAA Tournament appearances. When she left Auburn in 2012, Fortner was the image of a woman who had spent enough time coaching basketball. “I’ve had a wonderful time, and I’ve had some great experiences. I’m just ready to do something else. That’s the bottom line,” she said, courtesy of AL.com. Evidently, Fortner was refreshed by her time at ESPN as a television analyst, enough so to return to coaching. Fortner has received plenty of praise from colleagues. “Having played for and coached against Nell, she brings positivity, energy and experience at the highest level that her student-athletes will enjoy and embrace,” said South Carolina women’s basketball head coach Dawn Staley. “She will bring energy and work ethic, but also great basketball knowledge,” added Baylor coach Kim Mulkey. Certainly, Fortner is not burdened by the wear and tear of recent seasons. But for that same reason, it is fair to wonder whether she is prepared for the non-stop rigors of coaching college basketball again. As Josh Pastner mentioned in a 2017 interview with the Technique, coaches must constantly stay on top of the trends and preferences of young athletes. Fortner must be careful from her opening statement onwards to portray herself as in touch. After all, another coach the Jackets were reportedly considering, Buffalo’s Felisha Legette-Jack, has much more recent experience and has not taken time away from the game. If Fortner fails to lure the high-caliber recruits that Joseph has brought to the table in recent years — among them this year’s five-star freshmen — her honeymoon period in Atlanta may soon be over. Nell Fortner served as a commentator for much of the NCAA Women’s Tournament this year — but next year, she will likely be expected to lead her team to the big dance. It is a tall task, but her experience at the collegiate, professional and international levels leave room for optimism.